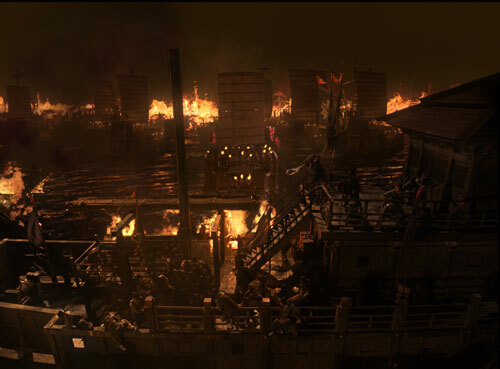 The ships in the titanic Battle of Red Cliffs in Red Cliff were created and animated using a rule-based particle system called Thinking Particles, a plug-in for 3ds Max from Cebas. For Frantic Films, there were a number of advantages to this pipeline. Static components such as crow’s nests and masts were modelled and textured with a few variations that the particle system would choose from with scale variation added in x, y and z during assembly, so no two components were the exact same shape. This gave the artists a lot of variation in each boat while keeping with the general design. This system also allowed for the combining of both animated and static components on each boat and have them react to each other. For example, Thinking Particles would vary the rocking of the boats, which would affect the swaying of the beam and sail while keeping them attached to the mast. Using a particle system made it easy to randomise and control the large number of objects. CG models were imported from Autodesk Maya into Autodesk 3ds Max, in which the bulk of the 3D work was done. Compositing was done with eyeon Fusion. 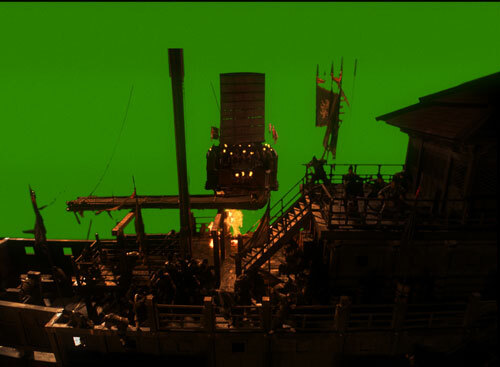 As well as Thinking Particles, plug-ins used included Cebas Final Render and FumeFX, while SynthEyes from Andersson Technologies was used for the camera tracking process. In addition, Frantic utilized several propriety tools, including Flood: Surf for the fluid surfaces rendered in Final Render, and Flood for the fluid dynamic interaction of wakes and shots of performers diving overboard. Frantic also used Massive Software, the AI-driven crowd simulation software, creating a Massive pipeline specifically for the film to get the 70,000 soldiers animated over 2,500 boats. The artists were able to integrate and utilise this in a unique way that sped up the production process without sacrificing quality. 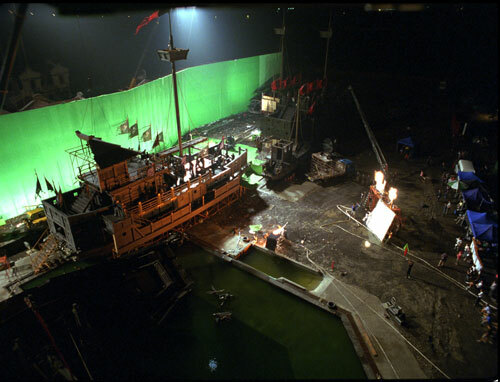 Over five weeks, the team used the Massive pipeline to animate various boat crews, generating thousands of frames of the virtual performers. Thinking Particles was then used to modify each crew’s animation, grabbing random frames and positions and then randomly propagating these crews throughout the fleet. So while Massive became the engine for animation, Thinking Particles was the distribution. 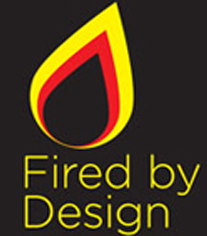 © 2009 – 2018, Michael Burns. All rights reserved.